Adler, Mortimer J. Ten Philosophical Mistakes. NY: Collier, 1987. Chervin, Ronda and Eugene Kevane. Love of Wisdom: An Introduction to Christian Philosophy. San Francisco: Ignatius, 1988. Maluf, Francis. Philosophia Perennis, Volume 1: An Introduction to Philosophy as Wisdom. Richmond: Saint Benedict Center, 1995. Maritain, Jacques. An Introduction to Philosophy. Westminster: Christian Classics, 1989. Pieper, Josef. 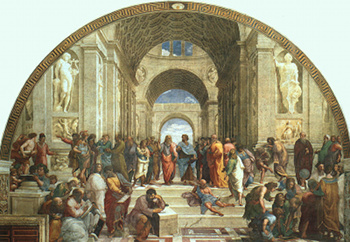 In Defense of Philosophy: Classical Wisdom Stands Up to Modern Challenges. San Francisco: Ignatius, 1992.
de Torre, Joseph M. Christian Philosophy. Philippines: Vera-Reyes, 1989. Young, John. Reasoning Things Out. Fort Worth: Stella Maris, 1982. Copleston, Frederick. A History of Philosophy, Vols. I-IX. Garden City: Image, 1962-1977. _____. Harper Torchbooks, The Cathedral Library: Medieval Philosophy. NY: Harper & Row, 1961. Glenn, Paul J. The History of Philosophy: A Text Book for Undergraduates. St. Louis: B. Herder, 1947. Maurer, Armand A. The Etienne Gilson Series 4: Medieval Philosophy. Toronto: Pontifical Institute of Mediaeval Studies, 1982.